I have been in my editing cave for a while now, combined with some family responsibilities and I have been a bad girl about blogging. Today I decided to let you in to my world. I read somewhere that we are more apt to remember the sad, the bad and the ugly rather than the good. Rather that the bad stuff takes up more space in your brain than the good and we can get trapped in a cycle of remembering the unpleasant. This doesn't have to be. We can choose to remember the good instead of bad. Or at least counter act the bad with good when we feel as if we've gone down that road. For me this has taken the form of a happiness journal. Everyday until the rest of the year I've vowed to right down one thing a day that made me joy or brought on feelings of happiness. And as you will note, (this is day four) it hasn't taken me long to find more than one thing that has made me happy. I saw a bunny on the way to work, along Mcculloch rd. Got the news that S's tumor has shrunk due to radiation and chemo treatments. After having Lunch with G I ended up having a conversation with an Brazilian Student and a Japanese scholar about Language. 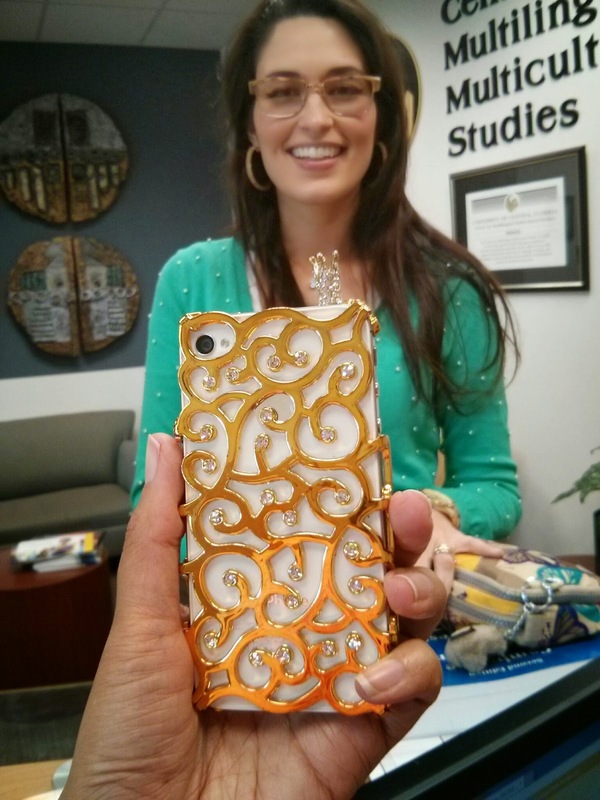 Then the Brazilian's wife showed up with her blinged out I-phone case.